Congratulations, you own your own business! You have customers and a website, you’re active on social media and you have marketing materials. Like your marketing is falling on deaf ears. Pressure from your clients, prospects and competitors to lower your prices. So busy! You can’t take on any more business because you can’t work any more hours. Burned out and unsure how you can continue to grow. If any of the above are true for you, then you are not operating from, or marketing to, your Sweet Spot. As author and serial entrepreneur Mike Michalowicz points out in his book The Pumpkin Plan, growing an extraordinary business is just like growing an award winning, colossal pumpkin. Just as you need to start with a special seed to grow a giant pumpkin, you must also start with a special seed—your Sweet Spot—to experience extraordinary business growth. 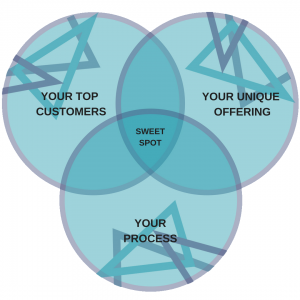 How do you determine your Sweet Spot? Your top customers – by clearly defining your top customers, you will be able to attract more of them. Your unique offering – if you stand out from others in your industry, you are no longer seen as having competitors and are not subject to competitive pricing. Your process – how you deliver consistent results. Once you define these three areas, find out where they intersect. If you have children in school or are a math connoisseur, you know this as the Venn diagram. A Venn diagram uses a circle to represent a set. The circles are overlapped to indicate what one set has in common with the other sets. Where all three circle overlap is your special seed. This is your Sweet Spot! Once you know your Sweet Spot making decisions like what to show and tell on social media, your website, and your marketing is easy. It will enable you to align your story directly with those that are seeking your unique services: your ideal prospects. Why? Because when you are in your Sweet Spot, you are profitably selling something unique that your best clients want more of! And you have the systems, processes and people in place to easily deliver it, without your direct involvement, over and over again. As you update your website, marketing materials or post on social media, do it with intention! The intention that you will not receive many calls from prospects to learn more about your company and pricing, but from few clients who know that you are the solution to their need. This is, in essence, what the Pumpkin Plan is all about – identifying your Sweet Spot so that you can make business decisions with intention. To learn more about how to find your Sweet Spot click here.